DIARY OF A CONSERVATIVE PARTY AGENT: And we will stand FREE AND BRITISH FOREVER! FLOREAT GIBRALTAR! And we will stand FREE AND BRITISH FOREVER! FLOREAT GIBRALTAR! For those who share my love of and support for Britain's Overseas Territories, the annual Conservative Friends of Gibraltar Reception addressed by the Chief Minister, is one of the highlights of the Party Conference. For those who were unable to attend or who were there but did not hear his words, I am pleased to reprint the Chief Minister's speech below. I think I have listened to twelve such speeches over the years. This is probably the best. I would like to express me thanks to The Rt Hon Fabian Picardo for sending this to me. I messaged him yesterday afternoon to ask for a copy and it was in my inbox when I woke up. The fact the Chief Minister bothered to read and respond (and so fast) is a reflection of his character. I am sure he had much more important things to do. A really big thank you from Gibraltar. Thank you for being here. Thank you, for your support over this incredible year. The people of Gibraltar know they can always count on the support of the Conservative Party. In particular I must thank the Conservative members of the Gibraltar Group in Parliament ably led by Bob Neil and supported by so many others. Indeed, I don't think that there is a Conservative Member of Parliament who does not support Gibraltar. But, trust me. We don’t take that for granted. It really is a pleasure to be here in Manchester with you and in the excellent company of the Foreign Secretary [AND THE SECRETARY OF STATE FOR INTERNATIONAL TRADE]. Both have been stalwart supporters of Gibraltar BEFORE and DURING their time in the Cabinet. Boris will recall how just days after the referendum, hot on the heels of very firm assurances to Gibraltar from the newly appointed Prime Minister, he welcomed me into his office with a glass of French red wine. We toasted the prosperous British future of Gibraltar. It was the start of an excellent friendship. Since that day every minister, every team of officials that we have met – Foreign Office, Home Office, Treasury, Trade, Environment, all of them - have made us feel just how close we are to the United Kingdom and its people and that we are truly appreciated as an integral part of the British family of nations. Politically, our friendship and partnership is ministered to by the equally robust and supportive Sir Alan Duncan - an old boy of RAF Four Corners in Gibraltar, where he lived in his happy early years when his father was Wing Commander on the Rock. And at the Treasury, Steven Barclay undertakes the work of ensuring we resolve all issues on financial services in time for Brexit day. Also, in particular, in nurturing of the day to day relationship is Gibraltar's point man in DeExEu, Robin Walker. I must tell you Robin works as hard for Gibraltar as any one of my own Ministers and that comes across in the detailed work we are doing in preparing Gibraltar for a RED WHITE AND BLUE BRITISH BREXIT ALONGSIDE BRITAIN. Because Conservatives - whether they were advocates of remain or leave in the referendum - have stood by us as we look to the challenges that the decision to leave the European Union set before us. And our partnership will deliver a successful Brexit for Gibraltar. A prosperous Brexit for Gibraltar. Because we are already working on maintaining and enhancing our access to our most important market, the UK market on the basis of a common regulatory standard agreed between us. A fantastic reinforcement for David Davis’ cast iron, clear and unequivocal pledge to us that the United Kingdom would not do any deal on future trade with the European Union if Gibraltar was left out of it because of Spanish pressure. That is what friendship and commitment means in practical terms! The European Commission has already bent to Spanish pressure in its shoddy and probably illegal negotiating guidelines on Gibraltar. But I do not believe this is a Conservative Government that will ever surrender to Spain pressure to sacrifice Gibraltar's commercial interests and its prosperity. I just do not see Boris Johnson surrendering one grain of sand or any aspect of sovereignty, jurisdiction or control over Gibraltar. Nor Theresa May. Nor Liam Fox. Nor David Davis. Do you? And I have no doubt that Spain will nonetheless understand that the United Kingdom and Gibraltar are seeking a string future relationship based on mutual respect and with mutual commercial benefit for all sides as move forward toward our future outside the European Union. Because we continue to seek friendship from our Spanish neighbours and all our European partners. Together we can convince all of them that the way ahead is trade and friendship, co-operation and security, partnership and shared values. But we will never compromise any aspect of sovereignty, jurisdiction or control in exchange for any commercial advantage. Our British Sovereignty means more than anything to us. Indeed, just three weeks ago we celebrated 50 years since we voted in our first referendum by 99% to remain British. 15 years ago we voted again by 99% in a second referendum to stay British when Jack Straw tried to betray us in a Joint Sovereignty arrangement with Spain. Spain insisted then and insists now that both our referenda were illegal. But in the words of the enduring slogan of the 1967 Referendum: BRITISH WE ARE AND BRITISH WE STAY. 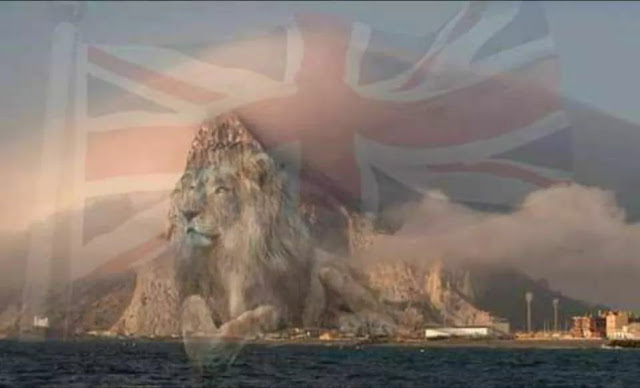 On the day of the 50th anniversary the Prime Minister told the people of Gibraltar in a televised message that Britain is absolutely steadfast in its support of the Rock, its people and its economic future. Thank you Theresa May for that unequivocal support. We know that support comes through the Prime Minister from across the British people and across the whole Parliament. We know that when things get tough, as they will from time to time in the negotiations with the EU, we will have full support from both Houses of Parliament at Westminster. Clearly the strongest voices in that choir are those of you gathered here in this room. And your support and because of our great bond and the efforts made by our respective governments to ENERGETICALLY AND ENTHUSIASTICALLY make a success of that democratic referendum, the fears of 96% in Gibraltar who voted to remain have to date been met with genuine and realistic reassurance. As a result, the Gibraltar economy has moved ahead full steam. The quarterly figure of unemployed for the quarter that ended yesterday is 85 individuals. More cross frontier workers are coming to Gibraltar than ever before. 13,000 people cross the frontier every day to work in Gibraltar. 7,000 of the Spanish. Gibraltar's GDP per capital is amongst the highest in the world. Our GDP growth has exceeded expectations again this year. More companies are applying to do insurance and online gaming business in Gibraltar AFTER the result of the BREXIT referendum than before. AND, I am confident that in PARTNERSHIP WITH BRITAIN - I KNOW we are going to make this work. I KNOW that you will be there with us shoulder to shoulder. AND I KNOW that with the continued concerted effort made by the dynamic entrepreneurs and hard-working people of Gibraltar - OUR GREAT ROCK OF AGES will hold its own.